Lochend Boxing Club are hoping for triple gold at tomorrow’s Elite Scottish amateur finals. Matthew McHale will be looking to retain his 56kg crown and claim his third Scottish gold having also finished top of the podium in 2015. The 22-year-old faces Stephen Donald of St Francis Boxing Club. “I’m really looking forward to tomorrow night,” McHale said. “It’s been a good camp so I can’t wait to get in the ring. I don’t really know much about my opponent so I don’t have much to go by. It’s just about me using my strengths in there. I’m not underestimating him by any means. Reigning Scottish and British champion Sean Spence (64kg) faces Greenock’s Robbie McKechnie. 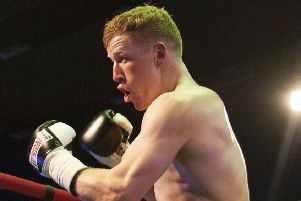 And at 81kg, former Scottish champion James Nelson returns after a couple of years away from the sport when he goes toe-to-toe with Bellahouston’s Robbie Connor. Leith Victoria’s Megan Reid (60-64kg) goes for gold against Stacey Carr and Amish Ayman, also from Leith, faces Dennistoun’s Nicholas Campbell in their 91+kg bout.